Would you like to save some money on Lexmark toners? If your Lexmark printer is running out of laser toner then you could make brilliant cost savings by purchasing all of your new Lexmark Optra E-312 toner cartridges with us. With Cartridge Save's competitive deals in addition to our low price policy you can rest confident of enjoying the very best deal for Lexmark Optra E 312 toner cartridges. Cartridge Save strive to please every shopper by giving you amazing prices along with Lexmark Optra E312 toner which are constructed to the highest quality standards. We'll give you fast and free delivery for Lexmark toner cartridges. The particular cost-effective Lexmark Optra E312 toner could be bought online on our secure website so don't delay and place your order now for the chance to make significant savings. Cartridge Save have a courteous team of advisors to help always make sure that buying a replacement Lexmark Optra E-312 toner cartridge is a quick and convenient process. Keep in mind that Lexmark Optra E 312 laser toners dispatched by us are guarded buy our cast iron money back guarantee which enables you time to claim a 100% refund in case you are unsatisfied because your toner isn't working. For the cheapest deal for Lexmark Optra E312 printer cartridges you just cannot get better than ordering from Cartridge Save. The lightweight and compact entry-level Lexmark E312 Optra laser printer is designed for home offices and small businesses. Quiet operation, 1200dpi image quality printing, and versatile media handling are some of the good points of the Lexmark Optra E312 mono laser printer. Unfortunately, the Optra E-312 may not be the best choice for the growing office because the E312 lacks networking and further expandability features. This 7.48Kg laser printer can easily fit on a desktop because it measures 8.8 inches tall, 14.4 inches deep, and 13.6 inches wide. 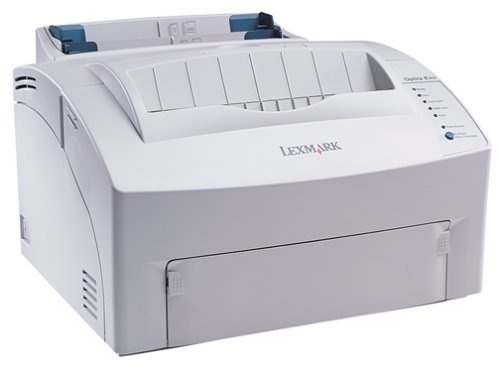 With a 67MHz processor, the Lexmark Optra E312 black and white office printer runs on 2MB of memory and data transfer is through a parallel or USB connection. Paper handling is through a 150-sheet input tray and a 100-sheet output bin, but there is a single sheet manual feed for speciality media. The Lexmark Optra E312 monochrome laser printer is quiet and users can print on a wider selection of media including transparencies, business cards, labels, and envelopes. The memory can be expanded to improve the speed. The Lexmark E312 Optra printer offers good font and language simulation support. There is room for an external serial adapter or a fast Ethernet port. The image quality can be tweaked to 1200dpi. Users can save money on Lexmark E312 printer toner by ordering a compatible Lexmark Optra E312 laser toner from an online shop. The memory of the Optra E-312 laser printer cannot be expanded beyond 66MB, and the print speed is somewhat slow when compared to the monochrome laser printers from the competition. The maximum resolution for text is up to 600x600dpi, and this could compromise the quality of small and italicised fonts. The Lexmark E312 printer does not have direct printing capabilities. Optional network or local ports need to be purchased separately.